Here is a quick pasta dinner that we enjoyed a few weeks ago. I saw it in an issue of Everyday Food Magazine and knew it would be quick and easy, which makes getting dinner on the table a little bit easier. I changed a couple of things in this recipe. I used whole wheat linguine instead of normal spaghetti. 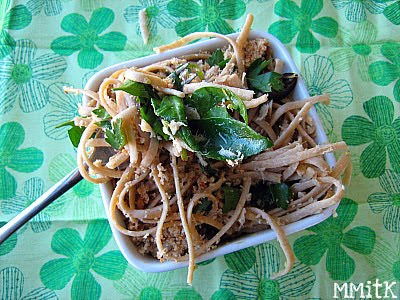 I usually try to use whole wheat pasta whenever we have pasta dishes just to get some extra nutrition and whole grains into our meals. No one in my family can tell the difference between whole wheat and "normal" pasta. This isn't a picky food for us. I used black olives instead of kalamata olives simply because I already had them in my pantry and my family likes the taste of black olives better than any other olive. I also used albacore tuna. I decided to wilt some spinach and add it to this dish because I wanted it to have some vegetables. 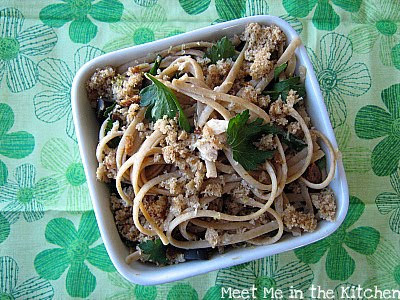 The fresh breadcrumbs and lemon flavor in this pasta really make it a winner. Everyone here really enjoyed it. I saved the leftover breadcrumbs in a little baggie and then re-used them when I reheated the pasta that was leftover. I also included the link to the recipe in its original form, in case making it that way sounds more appealing to you. Preheat oven to 350 degrees. Bring a large pot of salted water to a boil. Meanwhile, in a food processor, pulse bread and 1 teaspoon oil until coarse crumbs form. Spread on a rimmed baking sheet; season with salt and pepper. Bake until golden, tossing occasionally, 6 to 8 minutes. Cook pasta in boiling water until al dente. Steam spinach in microwave or on stovetop. Reserve 1/2 cup pasta water; drain pasta, and return to pot. Add lemon zest and juice, parsley, olives, and 1 tablespoon oil; toss, adding enough pasta water to coat. Add tuna; toss gently. Stir in wilted spinach. Serve sprinkled with breadcrumbs. This month for Secret Baker, we had a healthy theme. We were encouraged to bake something a little bit healthier than usual to send in the mail. I went to my King Arthur Flour Whole Grain Baking Cookbook to find a recipe. 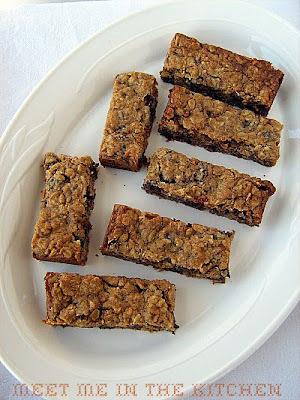 I decided to turn the Chewy Oatmeal Cookie recipe into bar cookies and made some changes with the add-ins so the finished product would be kind of like a granola bar. 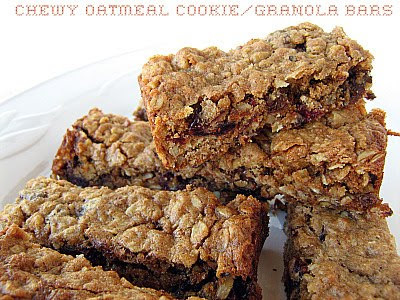 This recipe contains whole wheat flour and old-fashioned oats for the whole grains. I decided to use dried cranberries, sunflower seeds, chopped pecans, and chocolate chips as my add-ins. I also subbed in honey, instead of using dark corn syrup, simply because I didn't have any dark corn syrup. I put the batter in a 9x13-inch baking pan and estimated the baking time. I went with 25 minutes and when I pulled them out of the oven, they looked done. 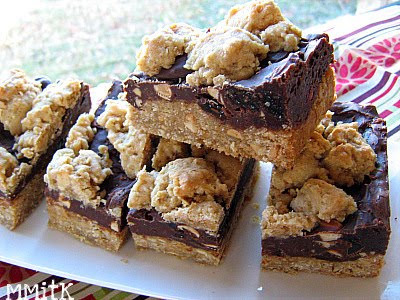 I let them cool, and then cut them into bars. I sent 1/2 to my Secret Baker recipient and half to my teenage brother, who adores oats more than almost anything. I just hoped for the best. My brother LOVED these. And the SB person I sent them to, said they were really good. I also recieved some goodies from Leslie, who blogs over at Lethally Delicious. She sent me The Barefoot Contessa's (Ina Garten) Granola Bars and Fruit and Nut Squares from Alice Medrich's Cookies and Brownies. Here is a similar recipe. Both of these treats were really delicious! Preheat the oven to 350 degrees. Lightly grease 2 baking sheets or line with parchment paper. Cream the butter, sugar, corn syrup, baking soda, baking powder, salt, spices, vinegar, and vanilla. Beat in the egg. Add the oats, flour, dried fruit and nuts, and stir to combine. Drop by heaping tablespoonfuls onto the prepared baking sheets. Bake the cookies, reversing the pans midway through, (top to bottom, bottom to top), until they're beginning to brown around the edges but are still soft in the center, 14 minutes. Remove them from the oven and transfer to a rack to cool. * I spread the batter in a 9*13 inch baking pan and baked them for 25 minutes. 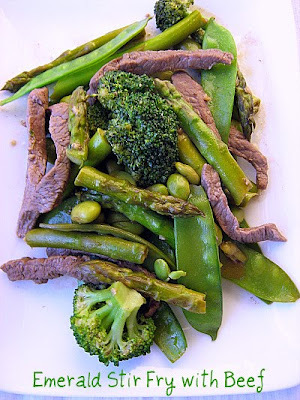 This week's CEiMB recipe, Emerald Stir-fry with Beef, was chosen by Alyssa, who blogs over at Alyssa's Two Bites. You can find the recipe on her blog or by following the link at the bottom of this post. I don't like beef and therefore, I don't cook with it usually, so at first I thought I would switch out the beef in this stir fry with some other protein. I decided to make the recipe as is, and bought the beef. Too bad I overcooked the beef. My family still ate it and liked it. This was a pretty good stir fry, although I felt like it could've used some ginger or something to give it a little bit more flavor. I didn't use the mirin, or white wine in the sauce, I just used a little bit more water. I served this over noodles because I like them more than rice. To see what everyone else thought about this stir fry, check out the CEiMB Blogroll. 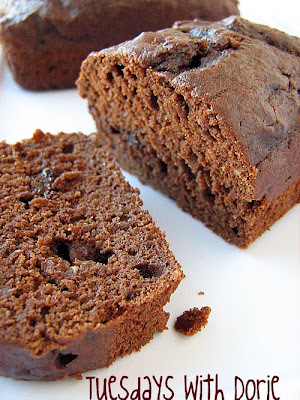 This week's TWD recipe, Cocoa-Nana Bread, was chosen by Steph who blogs over at Obsessed with Baking. You can find the recipe on her blog. I accidentally "healthified" this bread. We had just gotten back from DisneyWorld and I thought I would throw it together really quickly and take it to my nephews in DC. I had a couple of brown bananas and I didn't think to check if I had everything else I needed. I was only making 1/2 of the recipe and I started mixing away. That's when I realized I had no eggs. None. Not even 1 little egg. So, I frantically checked the freezer for possible stashes of frozen egg whites and found some. 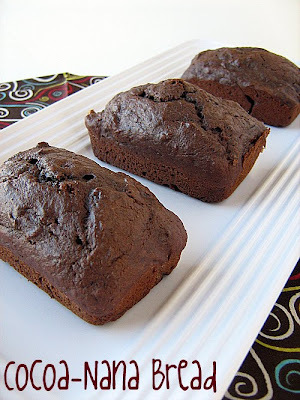 I had subbed whole wheat flour for half of the flour and used low-fat buttermilk, because that is the kind of buttermilk I always keep in my fridge, so I had a semi-healthy Cocoa-Nana Bread. 1/2 of the recipe made 3 mini loaves (pictured) and 1 larger, not really mini, but also not a regular sized loaf. I let my kids sample one of the mini loaves and then carefully wrapped the other 2, one for each nephew old enough to eat them, and the other small loaf (for my teenage brother, who was also going to be in DC), in plastic wrap. I then carefully transferred them to a large Ziploc bag and positioned them strategically in my backpack, hoping that they would slide through the security points at the airport undetected. Don't worry. It all went smoothly and when my nephews woke up the next morning I was able to present them each with a personal mini-loaf of chocolate-banana goodness that might have actually been an ok breakfast item. They loved them. So did my kids and my brother. Can't really go wrong with chocolate, if you ask me. Check out the rest of the TWD Bakers and see what everyone else thought. Many people were worried about this chocolate-banana combination! I first made this meal last summer. I had clipped the recipe for the roasted vegetables out of Family Circle Magazine and decided to make meatballs to round out the meal. I had some ground turkey and I just added ingredients that I thought would make a tasty meatball and hoped for the best. They turned out great and everyone was very excited about this dinner. I quickly wrote down the estimates of what I used for the meatballs, so I could make them again because I didn't take a picture of them that first time we ate them. I don't like repeating recipes over and over again, because I like to try new things all the time, but I knew that I wanted to make this particular meal again sometime. I recently made the meatballs and roasted vegetables again, this time using ground turkey breast for the meatballs and the results were great. The key to keeping the meatballs moist is browning them first in a little bit of oil, then adding liquid- I prefer chicken broth- and then covering them, to let them cook completely. I really love the combination of eggplant, green pepper, and red potatoes, that the recipe uses in the roasted vegetables. Chickpeas are added to these veggies, near the end of the roasting time and really enhance the whole dish. Top it off with fresh lemon juice, fresh herbs and a little feta, and you have got a real winner. Both times that I have made this meal, I have prepared the veggies first, and started roasting them, then made the meatballs while the veggies are in the oven. That way everything is ready at about the same time. Mix all meatball ingredients with a fork. Form meat mixture into balls about the size of golf balls. Heat 1 Tbls olive oil in a saute pan over med-high heat. Add 1/2 of the meatballs and brown on all sides. Add 1/3 cup chicken broth or water. cover with a lid and cook until meat is no longer pink in the middle, about 6-8 minutes. 1. Heat oven to 425 degree F. In a large roasting pan, toss together the potatoes, eggplants, onion, green pepper, 1-2 tablespoons of the olive oil, the garlic salt and pepper. Peel off the lemon zest with a peeler and add to mixture. Reserve lemon. Roast vegetables at 425 degree F for 30 minutes, stirring twice. 2. Add chickpeas and roast an additional 15 minutes. 3. Stir in juice from lemon, oregano and mint. Top with feta crumbles. One of my main goals, when I started the 10 in 10 challenge was to eat healthier breakfasts and lunches. We always eat healthy dinners, but sometimes I don't prep enough or plan ahead to make sure that I get in a healthy breakfast and lunch. I loathe almost all breakfast cereals. Cold cereal just isn't my thing. Although, I must say, that I really love Shredded Wheat'n Bran. It is even more delicious with fresh berries thrown in. I decided that for me, healthy breakfasts were going to have to include some combination of oats or another whole grain, fruit, peanut butter, eggs, and possibly, veggies. Not all these things on the same morning, but enough things to have variety day to day. Might as well start with the oats. I have had steel-cut oats before and I had some in the pantry, so I made a big batch of them, using Heidi Swanson's method of preparation in her cookbook Super Natural Cooking. 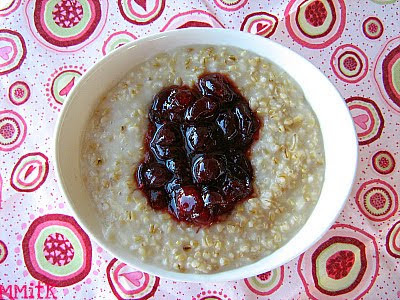 She also includes 7 ways to top steel-cut oats, but I had fresh cranberries, so I made a topping with fresh cranberries and pure maple syrup. That way I didn't have to add any sugar to the oats. The topping was just perfect. I also added sliced almonds and a little bit of skim milk, after I took the picture. Cooking this many oats at once was great because then I put the leftovers in an 8x8-inch pan and let them chill in the fridge overnight. 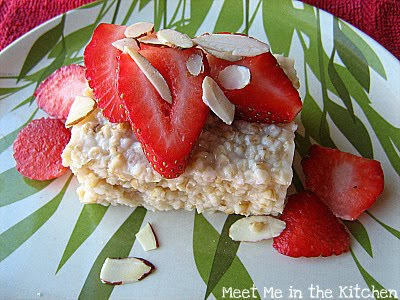 The next morning I was able to cut a piece out and enjoy it topped with strawberries and almonds. I also froze single servings in plastic containers with the cranberry topping, so I have a quick breakfast when I need one. Bring water to a boil. Stir in salt, then oats. Lower heat and barely simmer, uncovered for 35-40 minutes, until liquid is absorbed. Combine cranberries, syrup and water in a small saucepan and bring to a boil over med-high heat. Stir and lower heat to medium. Continue to cook, for 10-15 minutes or until bubbly and thick. 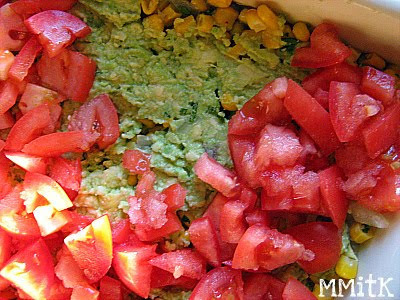 This week's CEiMB recipe is Five Layer Mexican Dip. It was chosen by Heather who blogs over at Mama Cooks. You can find the recipe on her blog or by clicking on the link at the bottom of this page. The Five Layers in this dip are: 1- a delicious black bean dip, made in the food processor with garlic, cumin, and other things 2- corn/cilantro mixture combined w/ some of the leftover onion/garlic from layer 1, 3-mashed avocado with lime juice, 4-chopped tomato, jalepeno, and scallions, 5- shredded cheese. I went back and forth about making this recipe, mainly because I have 2 tomato haters and 1 avocado hater in my family and didn't know how it would go over. I decided to make it for a family dinner that we were going to because then there would be more mouths to fill and hopefully more people that would like this dip. I didn't love it. Sorry. I am not going to lie to you. I wanted to really like it, but it was just ok. I liked the black bean layer and I would have rather eaten that with the chips. The corn/cilantro layer just didn't fit. I don't love frozen corn-not a big fan. Don't get me wrong, I love fresh corn on the cob, but not so much the frozen kernels. I just didn't appreciate all the layers together. Go check out the CEiMB Blogroll to see what everyone else thought about this one! This months choice for The Cake Slice was Red Velvet Cake. It had a boiled frosting that included pecans and coconut. I turned this recipe into cupcakes and they were taken to the homeless shelter for dinner, along with the coconut cupcakes I made the same day. I originally was planning to do the frosting that came with the cake recipe, but as the day progressed, I didn't have enough time. Then I thought a classic cream cheese frosting would be good, but I had no cream cheese. So, I ended up making Martha's Fluffy Vanilla Frosting because I had the ingredients and I figured it would be basic enough to taste good with the red velvet cupcakes and the coconut cupcakes. I saved one of these cupcakes for us to taste, because my daughter begged me too, so I got a little bite of the cupcake. It was delicious! I am not an expert on Red Velvet Cake. I don't really know what it is supposed to taste like or anything, but this one was amazing. I would definitely make this cake again. Check out the Cake Slice Blogroll to see what the other bakers thought about the Red Velvet Cake! 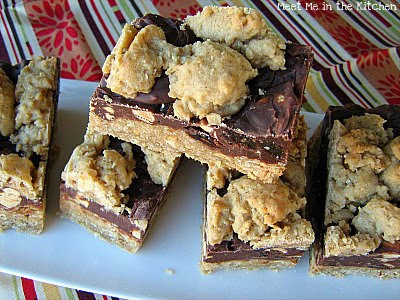 This weeks TWD recipe, Chocolate Oatmeal Almost-Candy Bars, was chosen by Lillian who blogs at Confectiona's Realm. You can find the recipe on her blog. 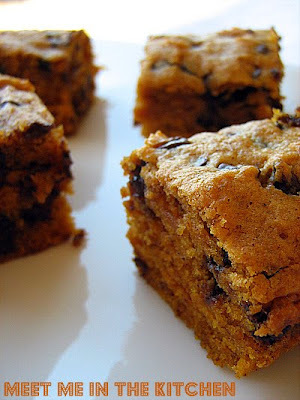 These bars are like a really thick oatmeal cookie batter, with a chocolate-y layer on top and then more of the cookie batter scattered on top of the chocolate. I made the recipe as is. I kept the peanuts in both the cookie batter and the chocolate layer, the raisins in the chocolate layer, and the cinnamon in the cookie batter. These are just some of the things that other people were talking about leaving out or subbing with something else. Luckily, I had a lunch that I was scheduled to bring cookies to, and these were all given away. We did sample one tiny slice, because after these are chilled in the fridge, it is possible to slice off 1/16th-inch slices, and it was a sugary, chocolately, peanutty, cookie delight. Tasted good and I am pretty sure almost anyone would be a fan of these. Check out the TWD Blogroll to see what everyone else did with these bars. Did they leave the raisins out? Swap out the nuts with something else? Go and see! 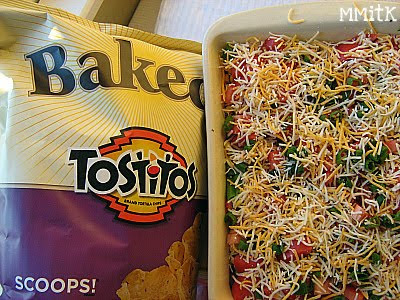 Growing up we frequently enjoyed 7 Layer Dip at family get-togethers and parties. There are many different variations on this recipe, but ours was usually as follows- refried beans on the bottom, a packet of taco seasoning or taco spice blend mixed with sour cream next, then guacamole, chopped tomatoes, sliced olives, shredded cheese, and sliced green onions. 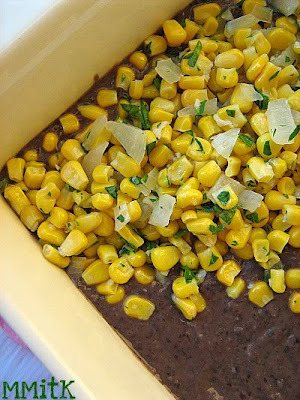 Serve it with tortilla chips and it makes a fantastic appetizer and/or snack. I saw a recipe for the same type of layer dip in a magazine over the holidays, but the flavors and ingredients were Meditteranean instead. I didn't follow the recipe, but I did see the idea, so it's not like I just imagined this up completely on my own. I put this together and served it with pre-made whole wheat pita chips. I usually like to make my own pita chips, but because of time, I bought pre-made this time. 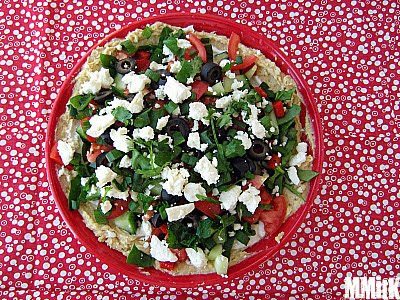 I started off with hummus as the bottom layer, then a thin layer of plain fat-free greek yogurt, sliced fresh spinach, chopped roasted red peppers, chopped tomatoes, chopped cucumber, sliced black olives, chopped green onions, chopped fresh parsley and then, crumbled feta over the whole thing. I finished it off by squeezing fresh lemon juice over the whole thing and boy, did we have a winner of a dip! We actually ate this for lunch and everyone in my family loved it. I love all of these ingredients and flavors anyway, but combining them in this way was really great. I had to remove the tomatoes from the section my hubby ate, but he liked it once I took those off. I scooped all the leftovers into a plastic container and ate them as lunch for a couple of days. This would be a great appetizer for a party or a great lunch/snack, so throw it together and see what you think! I didn't really measure the amounts when I was throwing this together. I just layered the ingredients and topped each layer with the next, by the amount that looked good. On a platter or plate, spread a thick layer of hummus. Top this with thin layer of greek yogurt, spreading almost to the edge, but leaving a 1/4-1/2 inch of the hummus uncovered. Next add a few handfuls of sliced fresh spinach. Top the spinach with the chopped peppers, cucumbers, tomatoes, olives, green onions, and parsley. 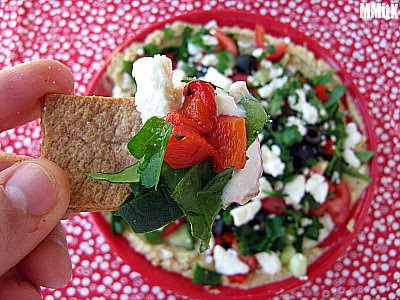 Sprinkle the desired amount of feta cheese over top and squeeze the juice from 1/2 or 1 lemon over the entire dip. 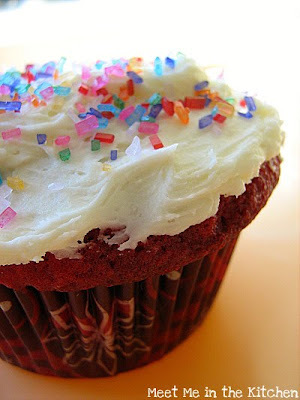 It's that day of the month again, the day we celebrate Cupcakes! 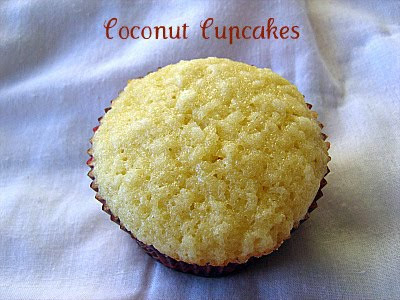 This months MSC selection-Coconut Cupcakes, was chosen by Jennifer over at Cinema Cupcakes. I decided to make these, as well as some Red Velvet Cupcakes (which I will post on the 20th for The Cake Slice) when I made dessert, as part of dinner, for the local homeless shelter. I didn't have to cut the recipe in 1/2 or anything, because I needed as many cupcakes as I could get. I got 24 cupcakes from the full recipe. 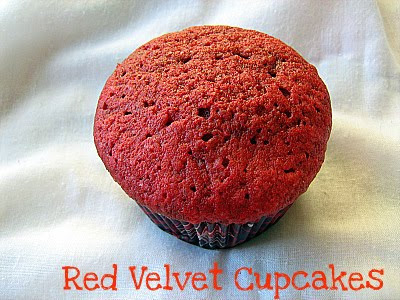 The recipe can be found on page 28-29 of Martha Stewart's Cupcakes. 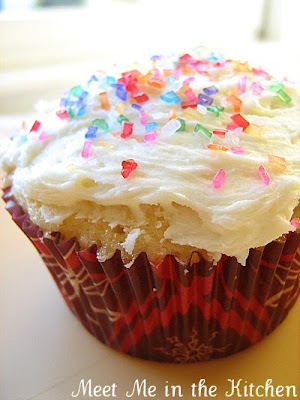 The recipe calls for a 7-minute frosting, flavored with coconut extract, but that isn't my favorite frosting and since I was making red velvet cupcakes too, I decided to make 1 frosting that would be good with both. I decided on cream cheese frosting. I ran to the store to pick up a few items for the dishes I was making for dinner, to serve at the homeless shelter and forgot cream cheese. Smart, I know. Well, time was running out and I had the ingredients for Martha's Fluffy Vanilla Frosting, which is also found in the cupcake book, so I just used that for both cupcakes. I didn't taste even a bite of these, but I let my son try one unfrosted and he said it was "Amazing!". They received many compliments that night, so I think they are a winner. Check out the MSC Blogroll to see what everyone else thought of these! I celebrated my recent birthday at Disney World. If you celebrate you birthday while you are on vacation there, you can get into the park free on that day. We had already bought our tickets, so I received a gift card that had the same amount of money it would have cost to buy 1 ticket to Disney World. I wasn't really planning on buying any souvenirs for myself on this trip, but since I was handed a gift card that had money on it, I decided I might just buy myself something. It wasn't too hard to narrow down my choices. I knew I would probably get something that I could use in the kitchen. 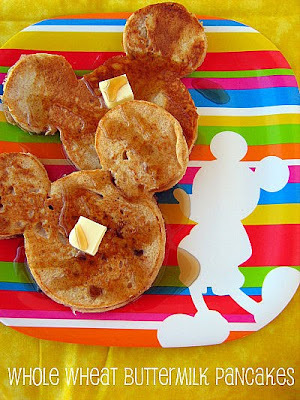 One of the items I chose was the Mickey Mouse-shaped pancake/egg mold that I used to make these pancakes. It isn't the same mold that the Food Librarian used when she made these Cinnamon-Oat Pancakes, but the plate is the same. I decided that I should try out a new pancake recipe and found these Whole Wheat Buttermilk Pancakes. I made a double batch and my kids really liked them. I made half of the batter into waffles and froze those for school mornings, when we are in a hurry. This recipe was really good and really quick to mix together. I will definitely make them again! You probably thought I was done with pumpkin. I think this is the last one. My sister sent me the link to this recipe and told me that she had made it, but that she left out the banana because she didn't know how that would affect the taste. Yes, this soup recipe has you saute chopped banana along with the onion, carrot, and celery when you start out making the soup. She said she absolutely loved the soup but was curious if the banana made a difference. I decided to give the soup a try. I cut the recipe in half and made it with the banana. The only thing I changed was that I started the whole thing out with canola oil instead of butter. I try to avoid butter in cooking whenever I can and just use canola or olive oil instead. This soup definitely has some very interesting ingredients. Besides the obvious- pumpkin and spices, there is the banana, coconut milk, condensed milk, chicken broth, curry powder, cinnamon, sage, allspice, nutmeg, coriander, bay leaf, etc. I mean, this soup really has it all. 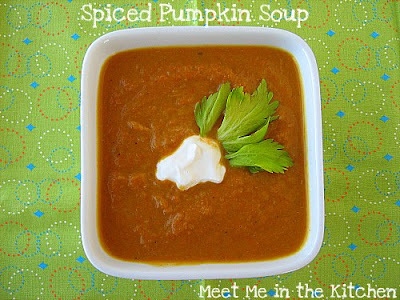 It is really interesting how all those flavors and spices melded together to make a delicious soup! This is definitely an adventure in the making and the tasting. My son was not a fan of this soup. He said it tasted like pumpkin pie with vegetables. I had to laugh at his comment because some of the flavors and spices were there, but I didn't exactly agree with him. I thought it was delicious. Because we went to DisneyWorld for Christmas, we had a family dinner with my husband's family the week before we left, to celebrate the holiday. We decided on an Italian theme and I brought this lasagna. This recipe is the lasagna that we ate growing up at my house and it is requested by one of my brothers every year for his birthday dinner. It is really simple and loaded with vegetables. Even my meat loving husband really loves this lasagna. The recipe calls for mushrooms, but this last time I made it, I forgot to buy mushrooms, so I just shredded a zucchini that I had in my fridge and sauteed that along with the veggies. You could probably substitute whatever vegetables you wanted to, just saute them along with the onion. 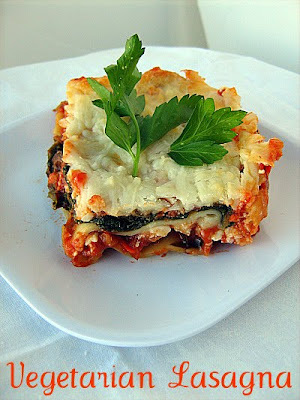 It is healthier than normal lasagna because it has lots of veggies, but also because the filling is made with cottage cheese instead of ricotta cheese and there are less layers of noodles. It was a big hit at our family dinner and is definitely a family favorite of ours. This recipe can also be prepped in the pan and frozen for a later date. Just add a few minutes on the cooking time to make sure that it cooks and warms through. Cook lasagne noodles according to pkg directions. Meanwhile, rinse spinach and place in saucepan. Cover and cook over medium heat until steam forms, then reduce heat and cook for a few minutes. Drain and set aside. In a large heavy saucepan, heat oil and saute carrots, onion, and mushrooms, until tender but not brown. Stir in tomato sauce, tomato paste, olives, oregano and basil. set aside. Combine cottage cheese and egg. I know everyone is probably pumpkin-ed out by now, but I had this post sitting in my drafts from before Christmas and thought I might as well get it out there, in case someone is in a pumpkin-y mood, or if someone still has a little bit of pumpkin they need to use in the fridge. I kept on seeing this on different blogs in Oct, all the way into Dec. and I finally just made a half recipe to see how good it was. I really love pumpkin things, so to me, it was great. 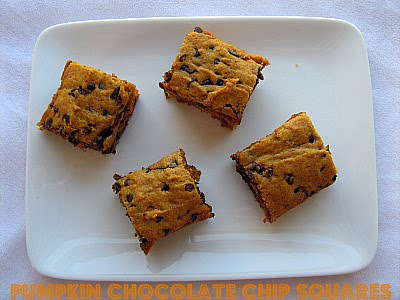 It really reminded me of the pumpkin chocolate chip cookies of my youth, which were a little bit more cake-like than cookie. This is going be a short post. We have been running around all day and I have a ton of things to do tonight, so there you go. A couple of days before we left for DisneyWorld, I tried to use up the veggies that I had in my fridge and decided it was the perfect day for risotto. The thing about risotto is that everyone thinks it is complicated for some reason. I used to think that and I don't even know why. When I actually tried it and made it at home, I realized that it is easy. You don't even have to stir it the entire time. You can walk away and do something else, come back, add more broth, stir, and do something else again. It's easy; once you have tried it and once you make it at home, you will want to try it again. I wanted to top my risotto with some roasted veggies and I had a butternut squash, turnips, and parsnips, so I decided that is what I would use. I also used up the rest of my fresh herbs that I had on hand, which happened to be-sage, rosemary, and oregano. Thyme would also be tasty here or whatever herbs you like to use to flavor your veggies. You could also use whatever combination of vegetables that you like- roasting them in the oven is the key. I got my veggies in the oven and then started on my risotto. The veggies ended up being done just a few minutes before the risotto, so they were ready to serve at the same time. I have also heard that risotto doesn't taste good warmed up or as leftovers. This is absolutely false, in my opinion. These leftovers were good cold, straight out of the fridge and tasted great warmed up too. 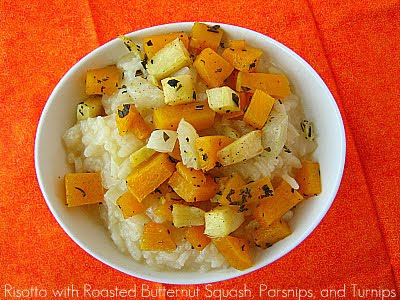 Preheat the oven to 425 degrees F. On a large baking sheet combine your squash, parsnips, turnips and chopped herbs. Drizzle with olive oil and toss. In a large, heavy saucepan, or dutch oven type pan, over medium high heat, warm 1 Tbls olive oil. Add onion and saute until soft and translucent, abt 5-7 minutes. Add garlic and cook for 1 minute. Add rice and stir, for about 2 minutes, making sure that the rice is mixed with the onion and coated with oil. Add 1 cup of chicken broth and stir. At this point you can stir continuously, or make sure you stir every few minutes. Add 1/2 cup to 1 cup chicken broth, once the rice has absorbed the broth that is already in the pan. Continue to stir and add broth, until the rice is creamy and all the broth has been absorbed. This process should take about 25-30 minutes. Grate fresh Parmesan into your risotto until it melts and is combined evenly. 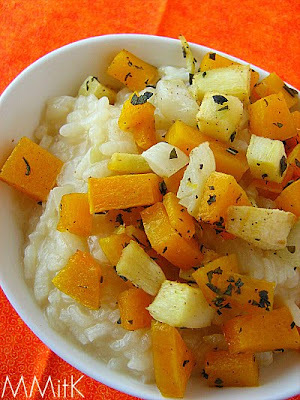 Scoop the risotto into bowls and top with the roasted veggies. I know that everyone gets different cravings. Some people crave chocolate, some crave sweets. Then there are people who crave salty or spicy. I have never been one who craves salty foods, but my younger sister would take french fries or potato chips over a chocolate bar, any day. Not that she eats french fries or potato chips everyday, but Santa used to bring her a big bag of Lays Potato Chips on Christmas day, while my older sister and I would get chocolate covered donuts or something. The point is, we all crave certain things and there is a solution to solving your salty craving. 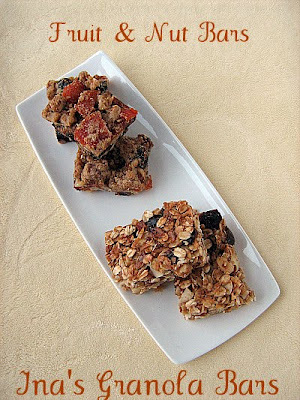 If you don't have a salty craving, here is a healthy snack that you will love anyway. 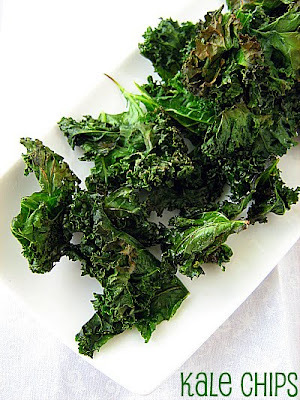 I first tried Kale Chips after reading the Dinner Dairies-Raising Whole Wheat Kids in a White Bread World. One woman's story about how she tried to change the way her family ate by making their meals more healthy, local, humane, etc. It is a great book and Betsy Block, the author, includes recipes along with her story. You can see a couple of the other recipes I tried HERE, the same post where I talked about Kale Chips before. I am telling you right now, there is no way that any one could not like this Kale. It absolutely transforms into something crispy and delicious. My family plows through it and we have been eating these frequently, from the day I first tried them. I love kale in lots of other ways, but if you are going to try it for the first time, try it this way. I pretty much guarantee success. 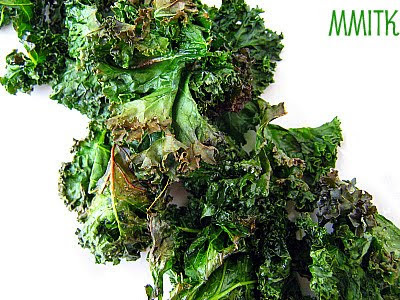 Wash and dry the kale and then chop or tear it into medium-size pieces. Spread it out onto a nonstick baking sheet. Spray the kale lightly with oil, and then sprinkle with salt and pepper to taste. Bake for 15-17 minutes, until light and crunchy (check every few minutes and give the pan a little shake to avoid burning. Quinoa is one of my favorite foods. My family loves it too. I buy mine in the bulk section of the local health food store. I love red quinoa too. It is better for you than rice, bulgur, millet, pasta, etc. Any of those things. It is a complete protein and you can prepare it in no time. 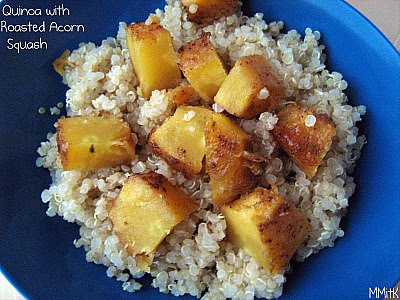 Make sure that you rinse your quinoa before cooking it. I put mine in a sieve and rinse it multiple times before I cook it. This removes the acidic, bitter coating that it has on it. I made a Greek salad with my quinoa and also served some roasted acorn squash over some of my quinoa the next day. It is so versatile. You can eat it warm or cold. Sweet or savory. You can add it to bake goods. Basically you can do whatever you want with it. It is a super food. 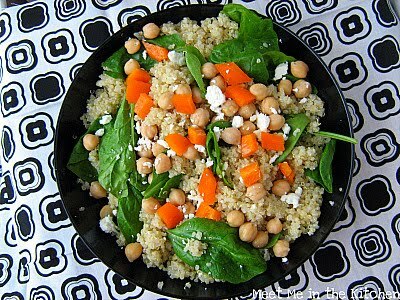 Combine quinoa, bell pepper, garbanzo beans, and spinach in a large bowl. Squeeze the juice of 1/2 lemon over the mixture. Drizzle with olive oil. Add Greek seasoning. Toss all ingredients and sprinkle feta cheese over top.